Legendary equipment is now tradeable but undroppable in game. This also includes legendary accessories (items you get by doing legendary quests) and customized blood set. This is to stop careless players from dropping these items accidentally from their inventory. Note: If by making the legendary accessories undroppable, it causes problem with getting the items through doing legendary quests (for example, boss may not be able to hand the item over to player after completing the quest), please let us know if this happened. The drop rate for this quest item is increased 2x. Hopefully this appeases players who find it hard to hunt for this item. Anyone doing slot expansion, please check this out and let us know. Universal Trickster Capes level 80 / 160 / 240 / 360 are now tradeable in game. Please be careful if you traded this item in game because this is a valuable item and in-game trades are not recorded in trade logs like what would happen if trades were done via Auction House on website. As much as possible, when you trade valuable items, please use Auction House so that the trades are logged. The web temper for dragon rings 30 / 70 / 140 / 190 should be working now. Elliot, you can try it and let us know. Phantom School is a place not well-explored by adventurers in Caballa Island. It gets overlooked often because players usually get diverted to continuing their quests to Mirage Island and then on to Alteo Empire. 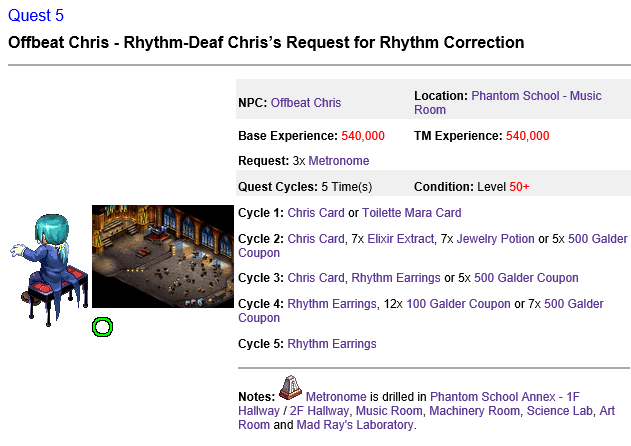 We have improved some of the features of Phantom School to make it more attractive for players do quests there. This will help players to walk through the hallways and in some classrooms easier. This also help when you want to do AFK drilling because you won’t constantly be attacked by monsters that are roaming around. Please remember though that monsters in Phantom School can hit hard. So once you attack them, they can really turn on the crazies on you. So make sure you are equipped as well as you can when playing there. 2. The following quests are improved as shown below (see red). Note: The high rates for EXP / TM should make these quests more attractive to do and should contribute to increasing players’ char levels quite nicely. This would make it easier for players to teleport to this safe place in Phantom School using this item. This is a special pet from our talented player and pet designer, RedSonja. It is sold in MyShop as per normal but you can also get it free if you were diligent enough to play and participate in our event this month. Please check the event description for more details. This is Aran’s special request pet, also designed by RedSonja. It is available in MyShop for this month. 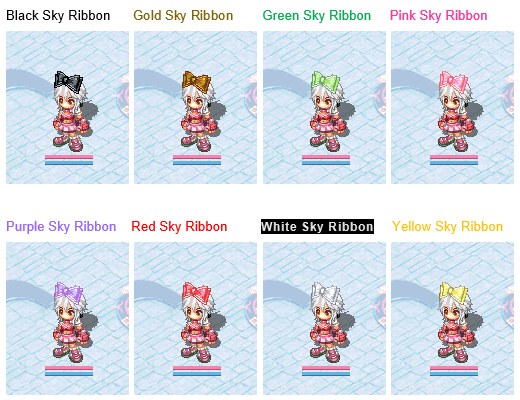 These items are a recolor of the Sky Blue Ribbon done by our player, ShiroHanna. They are available in MyShop for this month only. Field 1, 2, and 5 are unchanged. This event has ended. However, Item Boy Thomas is still available in Mega Square, and you can still make your dices and roll on the dice board for this month until next maintenance. The Dice Star Gift Box will no longer be dropped by monsters or drillable in maps across the island. This event has ended. Therefore, the 5th Anniversary items are no longer available as rewards for doing the quests stated in this event. However, if you have completed the quests but have not taken the rewards from the event page on website, you still can do so this month until next maintenance. Dropped by Nightmare monster Lv.182 at Phantom School Annex – 1F Hallway. Hunt Nightmare monster and gather Janus’s Mask. For every 100x masks you get, you can exchange for one Janus Hunt Ticket. You need 15x Janus Hunt Ticket to get the new Janus pet. Go to Event Garden and talk to Janus to do your exchange. Drill anywhere in Phantom School. 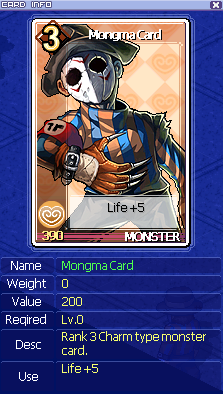 For every 100x masks you get, you can exchange for one Janus Drill Ticket. You need 30x Janus Drill Ticket to get the new Janus pet. Reserved for possible new infos. Looks great, cant wait to start a new character and do the new quests! Thank you for the great patch and event as always! one of my big wish was updating phantom school lol i am so surprised and happy at the same time. thank you so much! Translation: I'd like to suggest for the next halloween patch the pet Batty Bats Pet Skin. - Hiroto. Hey great looking patch! Thanks for hearing our cries about options for digging and hunting! Really awesome to see new changes being implemented. Is hovado trying to make me poor or something with all these new pets? Thanks for the nice patch ^^, suggest: can you make the dices trade-able ingame? Update on Carved Wooden Boxes. Edited by hovado, 12 September 2018 - 09:35 PM. And... Is it possible to bring (on the next patch ofc) the melon box? I used to have a melon set back to eTO and it would bring me back great old memories and feelings to have it again here on rTO.